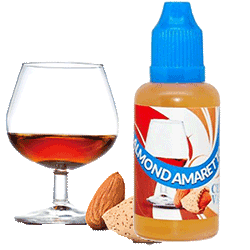 A nutty, smooth, amaretto vape liquid flavor based on the famous Italian liqueur. Almond Amaretto is a perfect vape to enjoy at night after a meal or with a cocktail. Really good clean flavor - tastes just as described. Love it! Pleasantly surprised with the vape. Exceptionally good flavor, and really did taste like Almond Amaretto. 5 stars might be a tad high, since it's not my absolute favorite, but I will order this juice again. I may have tried just a touch too early due to it smelling so darned good. Was pretty good at first but got better very quickly. Ended up reminding me of those almond flavored cookies I loved so much from my childhood. Flavor is great, maybe even a touch on the strong side. But I wouldn't change a thing. My only negative is that I wish I had noticed the tank cracker warning. But that's on me! It tastes like that wonderful pastry filling straight out of the mail box!! Will definitely be ordering again! Clean flavor and very smooth. two thumbs up guys! My buddy had this flavor in his tank and I tried it and just had to have it. I was pleased with the quick shipping and juice!